"Easy and elegant enough for the in-laws. Be sure, when filling the chops, not to stuff it too full, or the meat will be done cooking before the cheese has had a chance to melt." 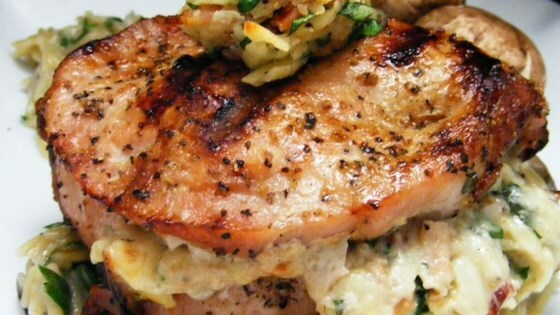 Prepare yourself for pork chop perfection! I thought the flavors if this dish were too simple and I did not like the cheese stuffed into the pork chop. It wasn't bad, but it definitely left me wanting something more.